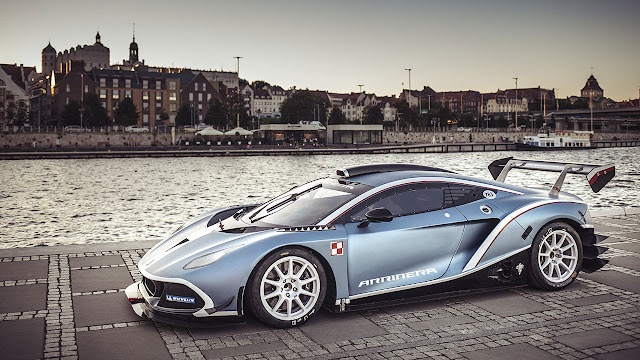 The blue Arrinera Hussarya GT prototype, the same one which distinguished itself as the first Polish car to ever tackle the famous hillclimb at the 2016 Goodwood Festival of Speed, visited Poland during a road tour which consisted of several photo locations in beautiful Polish cities. The car, which is a GT4 racer with a tubular frame, carbon fiber body, V8 engine and a sequential Hewland gearbox, looked its best against the backdrop of various spots in Szczecin, Wroclaw and Warsaw. In Szczecin the Hussarya GT visited the cobblestone-paved terraces overlooking the Odra river, with their flowing corners and monumental buildings atop the hill providing an unusual venue for a race car photoshoot, then the car appeared at a park in Szczecin which boasts Poland's largest population of plane trees. It looked positively awesome in the natural chiaroscuro environment. Then the Arrinera appeared in front of the Philharmonic in Szczecin, which in 2015 received the Mies van der Rohe prixe for the most beautiful building in Europe. Afterwards the car was transported to a secret location deep in Szczecin's harbor, and later to the newly rebuilt bank of the river, remodeled for the Tall Ships Races. In Wroclaw our car caused a considerable stir in the fabulous Old Town Square when we parked it in front of the 13th century town hall, and was constantly besieged by crowds of people, both Polish and foreign, anxious to take pictures of the sleek racer transplanted to the centre of the town which in 2016 is the European Culture Capital.